White Space Gallery, in association with the Tarkovsky Foundation, has published a book of previously unseen photographs by the legendary Russian filmmaker Andrey Tarkovsky (1932 - 1986). The written content of this book brings together reflections on photography by three generations of the Tarkovsky family: In the Introduction, the younger Andrey Tarkovsky comments on the photographs of his childhood that were taken by his father; a text by the latter considers the experience of going to his mother's house and looking at photos of his own childhood taken by family friend Lev Gornung; and a selection of Arseniy Tarkovsky's poems, including one about photography, punctuate the book. Accompanying these intimate reflections is an interview with leading Russian philosopher and cultural critic Boris Groys, Professor at the Center for Art and Media Technology Karlsruhe, by Nadim Samman and Anya Stonelake. Also included is a short essay by prominent photographer Stephen Gill. Where does art end and life begin? As this book will make clear, for Andrey Tarkovsky there could be no division. Andrey Tarkovsky is considered by many to be one of the greatest filmmakers the world has ever seen. Although he made just eight feature films before his life was cut tragically short by cancer, at the age of 54, each is an artistic masterpiece and a major landmark in world cinema. The focus of the book is an array of previously unseen polaroids from the Florence-based Tarkovsky Foundation, which is maintained by the filmmaker's son Andrey Tarkovsky. Taken in Russia and Italy between 1979 and 1984, the photographs range from romantic landscapes and studied portraits to private shots of the auteur's family and friends - including the distinguished scriptwriter Tonino Guerra. They demonstrate the singular compositional and visual-poetic ability of this master image-maker. Many of the polaroids that were created in Russia complement and extend the personal imagery of the film Mirror (1974). Equally rewarding cross-fertilization is apparent in the images that were taken in Italy while he was travelling with Tonino Guerra and preparing Nostalgia (1983). Indeed, from when Michelangelo Antonioni first gave Tarkovsky the Polaroid camera as a gift, in the 1970s, it rarely left his side. 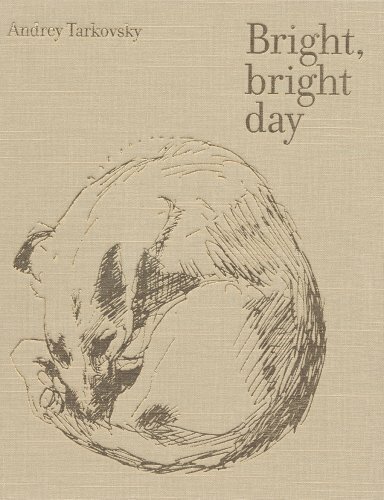 We are pleased to offer copies of Bright, Bright Day signed by Stephen Gill, who edited the photographs and penned an essay for the book.